This is my first attempt at pattern writing, so I would love it if someone could try it out to see if it makes sense. Even if you don’t have time to actually make the quilt, I would be happy even for a read through to make sure the wording makes sense and that there are no spelling errors. I am hoping to get some feedback within the next week as I would like to make this pattern for sale soon. If you can help me, just leave me a comment here and I will email the pattern out to you. Or you can email me directly at athenagwis at hotmail dot com. I really appreciate any help I can get. Update: I now have this pattern for sale! You can buy it in my Craftsy shop here or on Etsy. Great quilt – I would love to read over the pattern for you and if I can find enough time, put one together, and provide you with feedback. Cheers. I like it, looks good. I’d be happy to read/attempt to make the pattern. 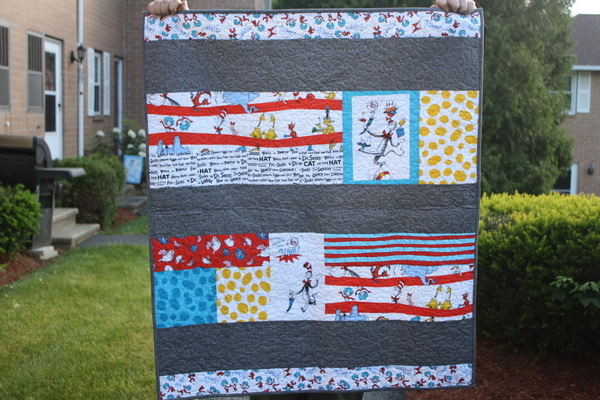 I actually have leftover Seuss fabric from a previous quilt so I think I can make it up. Love the quilt! I would be glad to read/try to make this quilt. Just let me know. Wishing you the best!